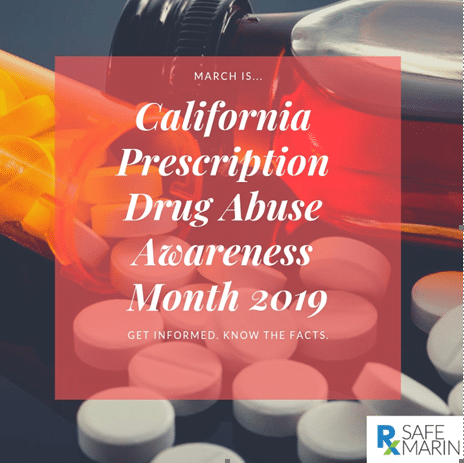 Prescription Drug Abuse Awareness Month was established through legislation sponsored by California State Senator Mark DeSaulnier and signed by Governor Brown in 2013. The designation of March as Prescription Drug Abuse Awareness Month provides the opportunity to engage your community to raise public awareness about prescription drug abuse. This month is very important for overdose deaths involving opioid pain relievers now exceed more deaths than heroin and cocaine combined. And as many as 70 percent of people who abuse prescription drugs get them from a relative or friend instead of a doctor. Due to this, prescription drug abuse has affected the youth, specifically teens. Almost 1 in 4 teens report having misused or abused prescription drugs at least once in their life (that’s around 5 million teens). For 38% of teens who have misused or abused prescription drugs obtained them from their parents’ medicine cabinet. And 80% of people who use heroin say they initially began using prescription painkillers recreationally. This fight against this epidemic can only be done with your help in raising awareness. So we, at RxSafe Marin, encourage community members and families to participate in prevention programs and activities, and spread the word.